Engraver on copper. Teacher of Russian engravers. In 1757, arrived in St. Petersburg and was appointed master of the portrait at the Academy of Sciences. He taught engraving at the Academy of Sciences and arts from 1759 till 1762, when he left Russia. In 1759, at the Academy of arts was founded engraving class, and Schmidt was the first teacher with the title of "chief engraver". In 1765 he was elected member of the St. Petersburg Academy of arts. His best student of E. P. Chemesov. One of the best engravers of the XVIII century and, along with D. Chodowiecki, the largest engraver of Germany, was born into a poor family of a weaver. Contrary to the father’s will, he enrolled at the Berlin Academy and became a pupil of the engraver Georg Paul Busch, master minor, but which taught her apprentice the secrets of the techniques of the craft. The German art school through this period of time of stagnation, and so more than the course in the Academy, capable young man given, perhaps, private lessons and copying engravings. Soon, however, the teaching was interrupted for six years Schmidt had to serve military service without losing, however, in every spare moment to continue painting and copy prints of French masters. At the same time strengthened the decision to go to Paris; only there it was possible to become a real engraver. Finally, in 1736, the order for a series of book illustrations delivered the necessary funds for this trip. On the way, in Strasbourg, Schmidt met with the artist M. Villa, also bound for Paris to continue his education. Since that time, they started a friendship that lasted a lifetime. In Paris, the friends, the first time was in poverty, but letters of recommendation the Berlin-based artist Antoine pan French painter Nicolas Lancret, and private engravings Schmidt with his paintings provided a beginning engraver, the master’s favor. Lancret helped Schmidt to get into the workshop of the famous engraver of Lemassena. The talent and zeal of the young German was soon nominated him from among the other disciples, and he had the opportunity to work together with their teacher on a number of engravings from the originals Lancret. 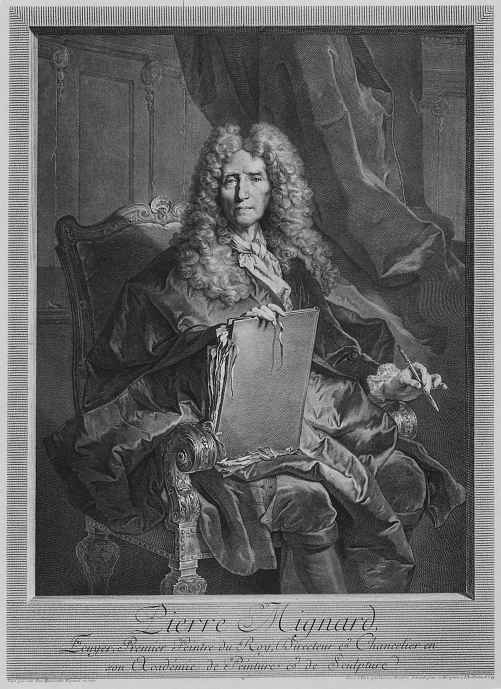 His work met the approval of another famous Parisian painter — Hyacinth Rigaud, thanks to the mediation of which Schmidt received orders for portraits of count d Evrie (1739) and Archbishop Karaskova (1741). These portraits brought him fame, and for the portrait of the painter Mignard Schmidt, despite the fact that I was a Protestant, was elected to the Royal Academy. 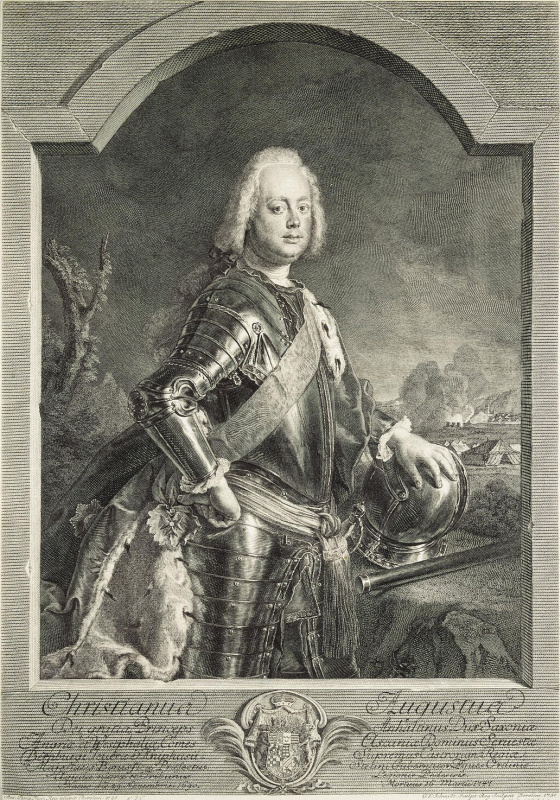 His future in Paris has been secured, but in 1744 he, at the invitation of the Prussian king Frederick the Great returned to Berlin, there to become a court engraver and teacher of the Academy. This step brought him into the mainstream of German artistic tradition. Although throughout the creative way Schmidt was under strong French influence, in Berlin, he has found independence as a printmaker and has trained many students as a teacher. If he stayed in Paris, it would be the same fate as his friend’s Villa, so became a Frenchman, and his work is most appropriate to classify French school of engraving. The most rigorous and technically sophisticated of the works of Schmidt to leave his Parisian work, some of the most brilliant and spectacular — Berlin. In the portraits created in the technique of engraving, Schmidt should be clear, strictly linear style and conveys the plasticity of the forms, the depth of shadows and a variety of textures and variations of line width of the cutter, reaching the great freedom and diversity of colors. Perfectly owning technique of engraving, Schmidt was weak in the picture, which is especially noticeable in his etchings on his own compositions. 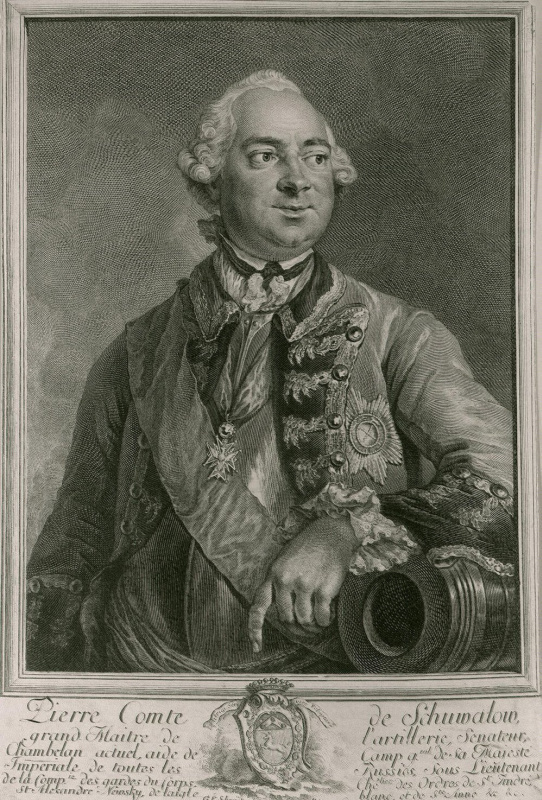 Schmidt, however, again left Berlin, where his life was going very well, where it was favored by king Frederick the Great and the king’s brother, Prince Henry, and where he’s been happily married a merchant’s daughter Dorothea Louise Wiesbaden. 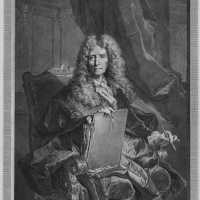 French portraitist, Louis Tocqué, who worked at the Russian court and enjoyed tremendous success there, recommended Schmidt as an experienced master and teacher of printmaking. As he wrote Yakob shtelin, who headed at that time the art Department of the St. Petersburg Academy of Sciences, "Gospodi Tocco… yesterday, in the presence of a large number of courtiers spoke in favor of Mr. Schmidt. He said that Schmidt in Paris earned ten thousand livres, that there reluctantly broke up with him, and if St. Petersburg Academy of arts will offer him 4,000 rubles, it will not be too, considering his talent as a teacher. However, slightly varies Staehelin, Mr. Schmidt’s demanding, but it is also true that such an experienced master like him is worth more than half a dozen mediocre, especially from the point of view of education students". The case was settled quickly, and after a few months Staehelin informed Schmidt: "I inform You that the Academy of Sciences and the Academy of arts appoint You as his first engraver for a period of five years. During this time, Your responsibilities include the cultivation of good students in Your field of expertise and guidance for all students in the engraving class at the same time… You will be engraving the portraits You ordered academic office". In 1757, despite the fact that there was a war of Russia with Prussia, Schmidt, with the permission of the king, he went to Petersburg. The disciples with him were Alex of the Greeks, Ekim and Philip Vnukova, Efim Vinogradov, Nikita Plotzes, Nikolai Sablin, Patrika Balabin and Artemyev Prokofy. When in 1759 was founded the engraving class at the new Academy of fine arts, Schmidt began teaching there, with the title of chief engraver. However, Staehelin was accusing him of that occupied by the execution of orders for portraits, Schmidt, little attention has been devoted to his students and to oversee them even had to write you from Vienna is still an engraver Tahera. The master was inclined to blame the negligence of their pupils: after he left Russia, he wrote Stalino, seeing one of the best works of his disciple E. Chemesov: "This boy makes me honor. If the rest of Your students then wanted to use my guide, You would be provided a good engravers". However, Schmidt’s stay in St. Petersburg had the most beneficial effect on the formation of Russian engravers and many of his students have achieved in this art form considerable perfection. St. Petersburg Academy of arts appreciated his merits, and in the autumn of 1765 was elected had left by the artist, along with M. V. Lomonosov, one of its first honorary members. After five years of stay in St. Petersburg Schmidt etched a few portraits, among which were the portraits of count S. R. Vorontsov, P. I. Shuvalov, count Esterhazy, Kirill Razumovsky. Misfortune befell him when working on a portrait of Empress Elizabeth of the original Tocco, the order which he had received immediately on his arrival. The work lasted three years and was finished in fourteen days before the death of Elizabeth, who was barely able to look at carried her portrait. Schmidt got about a third of the promised amount for unnecessary, perfectly executed portrait of the late Empress. In St. Petersburg Schmidt etched self-portrait (1758): in the room where on the wall hang a sword and violin, and the window is visible, the Russian Church and the hut, behind a table sits the artist draws with a serious and kind person. This was seen by his disciples: "This is a man in the Prime of life. He looks great, his face with a tan, eyes full of fire. He is cheerful, and it is imbued with conviction and solidity."